Momentum, a community for men and women, is a grassroots program that was started in September 2014. It is an initiative designed to drive an awareness and dialogue around the challenges that employees, particularly women, face in the workplace as well as educate, inspire, and encourage employees to support each other across the organization. As a global company, Marketo has the opportunity to be a leader in supporting and empowering employees to pursue their personal and professional goals. We recognize everyone can fit into a stereotype of some kind so we've created a safe place to break down the barriers we all face and work on ways to overcome them together. Through quarterly events with talented guest speakers from the Silicon Valley and beyond, we strive to increase mindfulness around issues of diversity and inclusion, strengthen employee skill sets, develop their careers, and build their personal brand and networks. Marketo employees deserve to be a part of an inclusive environment where individuals can learn, develop and succeed for the greater good of the company. CALLING ALL EMPLOYEES! As a Marketo employee, you’re invited to attend all Momentum events. This is not just a group for women. We strongly encourage men to join the conversation and the leadership team. As you can see above this group tackles several relevant issues for both genders. And, if you want to help determine the direction and development of the program, we’d love to have you on the Momentum leadership team. Email momentum@marketo.com to express your interest or to suggest potential speakers or organizations we should get involved with. Be sure to follow the Momentum group in Marketo Central. If you are interested in speaking at an upcoming meeting, please email momentum@marketo.com and include what you'd like to share. We are open to suggestions on topic and format! If you’re a Marketo partner, we’d welcome the opportunity to jointly host Momentum events. For more information, please email your interest to momentum@marketo.com. You can stay up to date with all upcoming events in Marketo Central. Please follow the Momentum page. 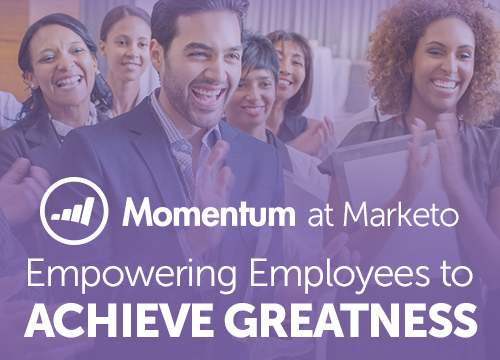 Marketo hosts Momentum events on a quarterly basis. To view past events click here.